From Parker Gallant’s Energy Perspectives, a view of how much wind power is costing Ontario. Almost a week after Premier Wynne announced her plan to reduce our electricity bills by 25%, the wind was blowing! On March 8th, six days after the cost shifting announcement (from ratepayer to taxpayer), potential power generation from wind was forecast by IESO to produce at levels of 80/95% of their capacity, for many hours of the day. IESO was concerned about grid stability and as a consequence, curtailed much of the forecasted generation. It is worth noting that much of that $50 billion was spent acquiring wind and solar generation and its associated spending on transmission, plus gas plants (to back them because the power is intermittent), and distribution assets to hook them into the grid or embed them with the local distribution companies. It would have been informative if Premier Wynne had had Energy Minister Glen Thibeault provide an accounting of exactly what the $50 billion was spent on. As it turned out the amount of curtailed wind generated on March 8th was 37,044 megawatt hours (MWh) was just short of the record of 38,018 MWh set almost a year ago on March 16, 2016 (estimated by my friend Scott Luft). 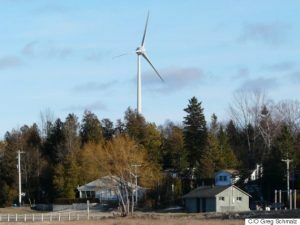 The curtailed wind on March 8, 2017 cost Ontario’s ratepayers $120/MWh or $4,445,280. The other interesting aspect of the surplus power generation on March 16th, 2016 and March 8th, 2017 is revealed in IESO’s Daily Market Summaries: the hourly Ontario energy price (HOEP) March 16th, 2016 was negative at -$1.25/MWh and on March 8th, 2017 was also negative at -.49 cents/MWh. This meant ratepayers paid for surplus exports sold to our neighbours in New York and Michigan, etc. Net exports (exports minus imports) on March 16, 2016 were 52,368 MWh, and on March 8, 2017 were 37,944 MWh. Total costs of their generation (HOEP + GA) fell to Ontario’s ratepayers along with the cost of any spilled hydro, steamed off nuclear and idling gas plants. I hope this helps Minister Thibeault in his calculations for a long overdue accounting of where the other $49.982 billion went. Is this why intelligent investors are using terms like ‘stranded debt’ and ‘stranded assets’? I have invited my colleague, Carmen Krogh, to speak at University of Waterloo on Mar 29, 2017 at 10am. All interested parties are welcome. Wow wow wow! The promises have started! An ad this morning on the radio said Ontario will enjoy the lowest hydro rates possible guaranteed for at least four years. The Liberal government will continue with strong policies blah blah blah. Same old, same old. On track to a balanced budget. Previous governments fudged the numbers. Corporations are not paying their share. The weathly are using loopholes. I hope this time the Liberal spin machine comes up with some new rhetoric to alternate the truth while lining their entitled pockets. Remember, the first word in Liberal is Li. I’m sure premier Wynnde ….. Glen Thibeault… the ministry of Energy…. et al ….. will toss my email in the “$$$$ you file!!…. Again…..